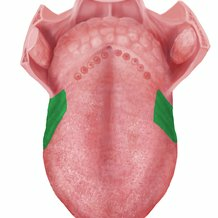 Structure of the tongue - want to learn more about it? 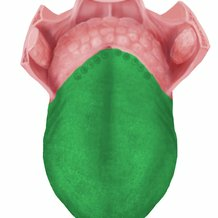 Overview of the structure of the tongue seen from cranial view of the dorsum. This article covers the anatomy, muscles, neurovasculature, and histology of the tongue. Learn more about it at Kenhub! How we taste? 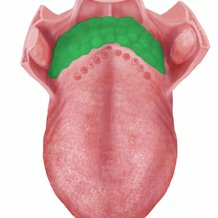 This article describes the anatomy and function of the tongue and the way our brain perceives taste. Learn this topic now at Kenhub. This article covers the anatomy, muscles (intrinsic and extrinsic), taste buds and gustatory pathway of the tongue. Learn more about this topic at Kenhub! This article covers the sensory and motor innervation of the tongue, together with its blood supply from the lingual artery. Learn this topic now at Kenhub! This article covers a list of tongue diseases and disorders, including the anatomy and histology of the tongue itself. Click now to learn more at Kenhub! This article describes the anatomy, histology, embryology of the tonsils and related clinical conditions (tonsilitis). Learn this topic now at Kenhub. This is an article covering the anatomy and pathology of the components of the Waldeyer’s Ring. Learn all about this structure here! This article covers the anatomy of the glossopharyngeal nerve (CN IX), focusing on its course, branches and its function. Learn all about it now at Kenhub! This is an article on the anatomy and function of the hypoglossal nerve. Learn all about the twelfth cranial nerve and see diagrams here. Learn everything about the oral cavity using this topic page. Click now to study the tongue anatomy and muscles at Kenhub! This is an article covering the histology of the upper digestive tract - oral cavity, esophagus, pharynx and stomach. Learn all about it now at Kenhub!